I fear of late that the focus of this blog has been leaning too heavily towards Auckland – Auckland housing – a crisis in the making / The activity in the NZ property market is largely the Auckland factor to name just two recent posts. So it was not surprising that I got an email just last week from a reader asking “Any insights on the wellington market and current trend? So for all of you who are in the capital city or keen to better understand the trends of the Wellington property market, here are my insights and analysis. 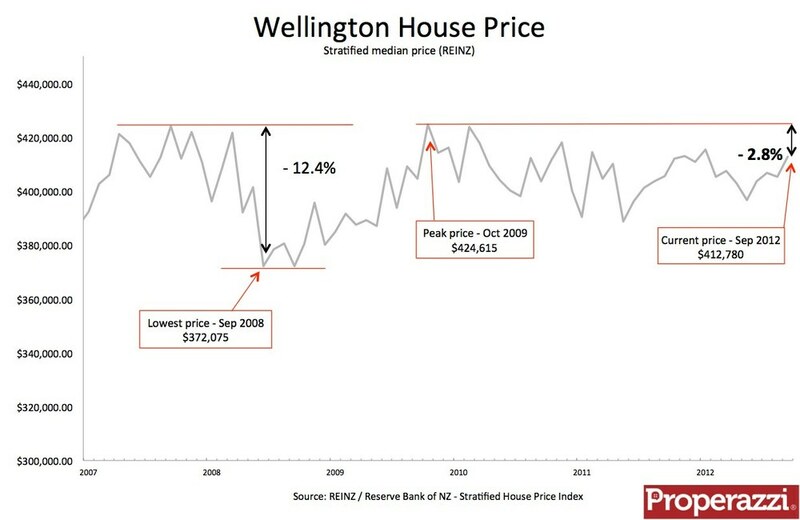 The trend in Wellington property prices is pretty clear – they are flat at best, and declining in real terms at worst. Here is the chart covering the past 5 years. 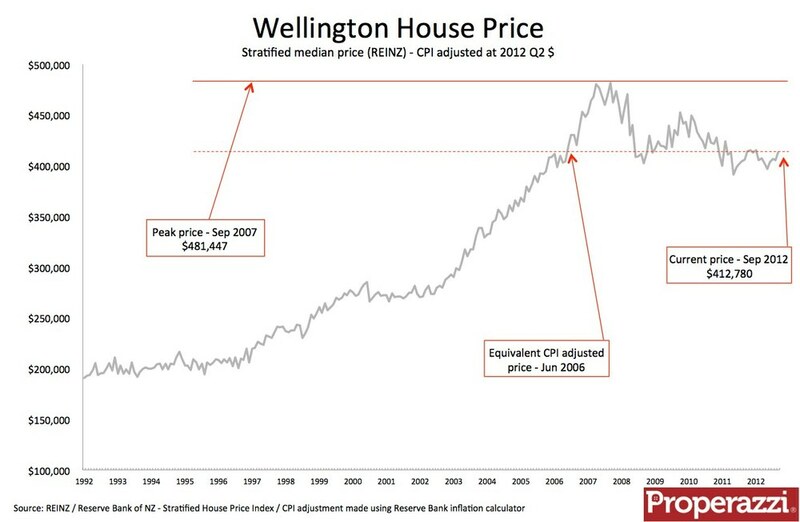 As ever I have used the Real Estate Institute Stratified median price, which covers the greater Wellington region. The current price for houses in the Wellington region is $412,780 which did show a reasonable increase on the August level of $405,125, however the price level tends to hover around a level of $400,000 to $420,000 as it has done for most of the past 5 years. The peak price nearly 3 years ago was $424,615 which means todays price is still 2.8% below that level. As ever inflation, whilst modest in annual rate over the period has eroded what little gains have been made over the past 5 years as shown in the chart below. With the prices adjusted to today’s dollar the peak of prices was exactly 5 years ago when prices then (adjusted by inflation) would equate to $481,447 which means that a median house bought 5 years ago would now be worth if sold at the median price 14.3% less after inflation. Looked at the other way as to affordability adjusted for inflation, the current level of $412,780 equates to a property price of over 6 years ago in June 2006 when at the time property prices were $360,705. The supply side and the demand side of the property market in Wellington are key indicators to assessing the state of the market. The supply side is best represented by the inventory of homes on the market, the September level of 20.4 weeks of equivalent sales as reported by Realestate.co.nz in the NZ Property Report showed a continuing level of inventory below the long term average of 22.2 weeks indicating that the property market continues to favour sellers. The level of recent sales continues to track ahead of prior years. The chart below tracks the rate of increase / decline in sales and new listings based on a 3 month period (September data being the end of Q3 for 2012. The recent quarter has seen a 10% higher level of sales in Wellington than in the prior year period which itself was up 7% on the Q3 for 2010. At the same time listings were flat year-on-year, a year ago the Q3 for 2011 was showing listings down 5% thereby demonstrating that listings and general inventory remain low driving the sellers' market, which is represented in strong demand as shown by the rate of growth in sales. The interesting situation in Wellington is that despite this relatively active market with more demand than supply, prices do not show any signs of coming under pressure which might indicate that despite the increased level of activity in absolute terms the market is not heated, but gently turning over with demand and supply adequately balanced.